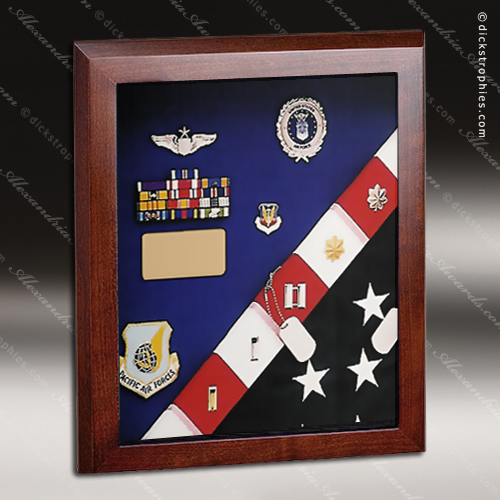 A combination Flag Case and Shadow Box to allow for the display of a grouping with the flag. Each display case features beautiful Appalachian Hardwood with an elegant Queen Anne Cherry finish, sturdy masonite backing, and 1/8" glass front. 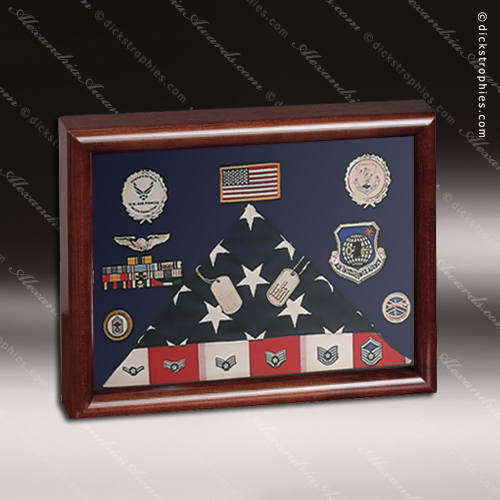 A silk-screened, paper, flag front is included for display. 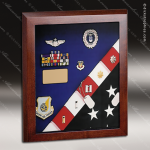 Velcro-compatible material is included in the Shadow Box area. The depth between the glass and masonite is 2 3/8". Available in red, royal blue, black, burgundy, green or gray velour. 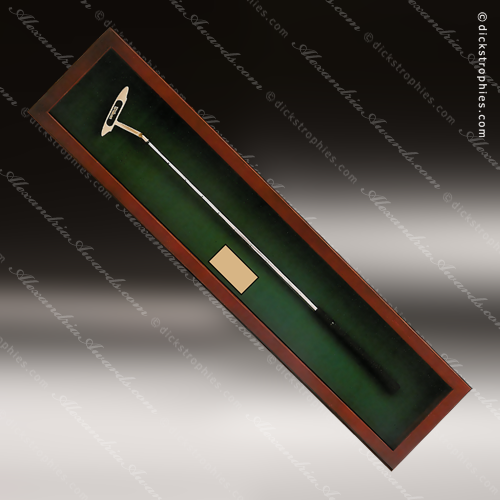 21" x 19" x 4" (Flag Size - 3' x 5') Shadow Box Area 17" x 6"
Ideal for housing a prized golf putter, dress sword, or groupings of memorabilia, the possibilities of this Shadow Box are endless. Appalachian Hardwood with an elegant Queen Anne Cherry finish, durable masonite backing, 1/8" glass front, and Velcro-compatible material. The depth between the glass and velour is 2 3/8". Available in red, royal blue, black, burgundy, green or gray velour. 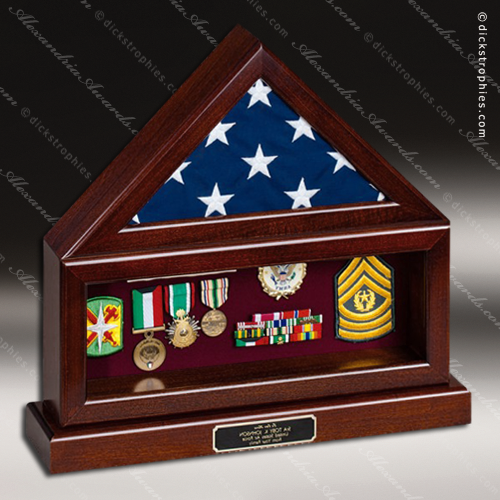 Shadow Box is available in Solid Cherry with an elegant Queen Anne Cherry finish, or Solid Oak with a Golden Oak finish. Each includes sturdy masonite backing, 1/8" glass front, and a choice of velour color. The depth between the glass and velour is 3/4". Velcro-compatible material is available for an additional charge. Available in red, royal blue, black, burgundy, green or gray velour. Flag and badges not included. Four sizes available. 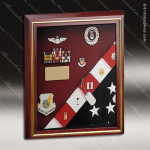 This series Shadow Boxes are constructed from Solid Cherry with an elegant Queen Anne Cherry finish and feature a distinctive gold accent trim. Each includes a durable masonite backing, 1/8" glass front, and your choice of velour color. The depth between the glass and velour is 3/4". Velcro-compatible material is available for an additional cost. Available in red, royal blue, black, burgundy, green or gray velour. Flag and badges not included. Five sizes available. 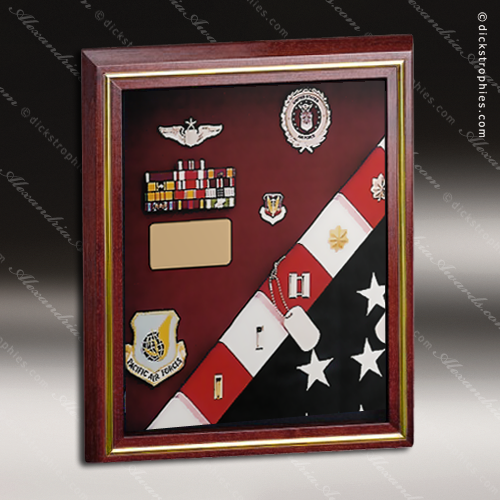 1" wide Round Bull-nose faced Solid Cherry Shadow Box frame with an elegant Queen Anne Cherry finish, durable masonite backing, 1/8" glass front, and your choice of velour color. The depth between the glass and velour is 1". Available in red, royal blue, black, burgundy, green or gray velour. Flag and badges not included. Four sizes available.